Following a week of changeable weather and high winds, Sunday morning was actually quite pleasant, not too hot and with a light breeze which later picked up towards the end of the outing. By prior arrangement with the Reserve Manager, Kyran Wright, the gate was opened at 07h30 and soon after the vehicles started rolling in! With the assistance of the Duty Ranger everyone was able to park safely. 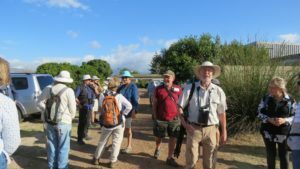 The turnout was a bit overwhelming with 45 Birders arriving, including a few visitors, some from the UK and USA and also some new and potential members. We wish all the new members many happy years of birding with the Club. It was really nice to have one family (new members) which included their two children aged 11 years and 9 years and hope that they will become really keen birders and enjoy future club outings. Because of the very large number, and the fact that on most of the paths one can only walk in single file, we split into three groups of approximately 15 and these were led my myself, John Magner and Simon Fogarty. 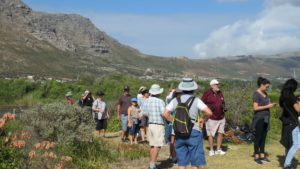 The first two groups set off in a clockwise direction and Simon’s group in an anti-clockwise direction and this worked quite well as all three groups got an average of some 40 species or a little more. Even before leaving the car park we had a few sightings of birds flying over including Barn Swallows, Glossy Ibis, African Darter, Reed Cormorant, Southern Fiscal and Cape Bulbul. 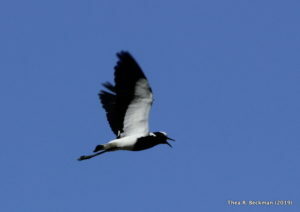 We could also hear Bokmakierie and Southern Boubou calling. The sequence of sightings is mainly based on my group but John’s group were following fairly close behind and so would be fairly similar. Simon’s group, on the other hand, going in the opposite direction, were able to add 9 species which John and I didn’t get including a Black Sparrowhawk, Peregrine Falcon and Common Greenshank. First stop was the canal adjacent to Marina da Gama which is quite badly polluted and did not produce much. 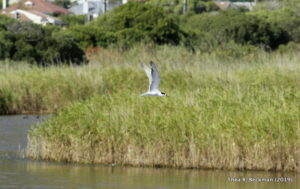 There were however a couple of Caspian terns flying up and down the canal and for some this was an exciting sighting. Also as we approached the canal a Purple Heron flew up and landed on the top of a nearby tree giving both groups a really good view. 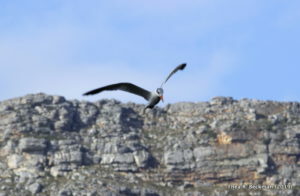 Leaving the canal and following the path to the Lookout Platform there were dozens of Barn Swallows hawking the midges, African Black Swifts doing the same and a couple of obliging Levaillant’s Cisticolas, with a Karoo Prinia calling nearby. 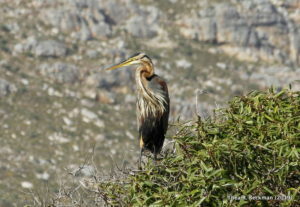 Throughout the walk there were often African Darters and Reed Cormorants flying overhead. The Lookout Platform was quite productive and gave everyone good views of, Hartlaub’s Gull, Blacksmith Lapwing, Cape Shoveler, Black-winged Stilt, Pied Kingfisher, Greater Flamingo, Little Egret, Red-knobbed Coot, Yellow-billed Duck and Common Tern. 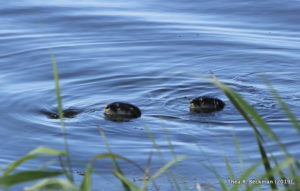 The highlight for our group was not however bird related but, when we reached the top of the platform, there were three Cape Clawless Otters swimming below us where the canal meets the vlei. They slowly swam off into deeper water and the group behind us managed to see one swimming towards the island. Between the Lookout and Skirpus Hide there were a number of African Darters and Reed Cormorants on the dead trees drying their wings and two White-breasted Cormorants. 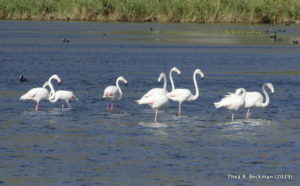 The Hide produced nothing other than a Karoo Prinia and Common Moorhen. On the way to the river section we had a fleeting glimpse of a Lesser Swamp Warbler but it kept us interested with its beautiful song. 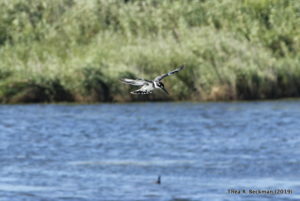 On the opposite bank there were a number of Cape Teal sitting on the bank and at least another three Pied Kingfishers. We also had a fleeting glimpse of a Malachite Kingfisher flying across the river but despite spending some time searching for it we were not successful – a pity as a number of the group were really keen to see it. At this stage it was a gathering of the Clans as John’s group caught up with us and Simon’s group met us going the other way!! Much discussion as to what had been seen thus far. 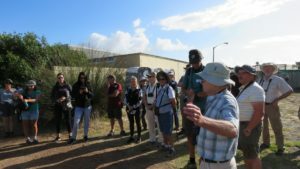 The Salt Marsh Pan, despite having a bit of water, was totally unproductive – perhaps with so little water it has become too salty? The Centre Pan is quite full but the only birds were a pair of Cape Teal, two Blacksmith Lapwings and a couple of Egyptian Geese. On reaching the shady picnic area we had our second non-birding highlight – a family of four Mongooses in the pathway who were in no hurry to disappear. I imagine these would have been the Small Grey Mongoose. A quick trip to the new Hide produced nothing other than what we had already seen. Those that were staying on, whilst we awaited the return of the other two groups, collected their refreshments from the car park and returned to the picnic area and some of the morning’s events were discussed. After a very pleasant morning with good company and some good sightings we ended up with a creditable combined total of 63 species which is a bit down on last year’s 69 but not bad at this time of the year when a lot of the breeding is over. Sincere thanks must go to Thea Beckman and Karin Wilson for their photographs which not only record some of the morning’s events but perhaps show what the many club outings have to offer. 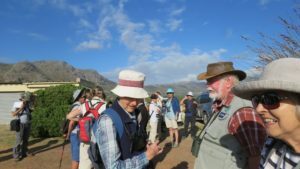 My very special thanks to John and Simon for their willing and vital help on the day, to the Zandvlei Nature Reserve Management and Staff for allowing and arranging access and of course to the Club Members and Visitors who supported the Outing.